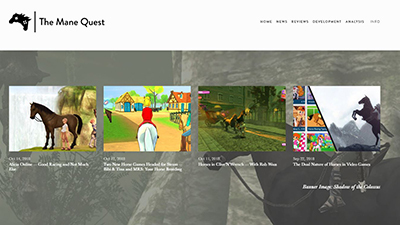 The Mane Quest is a website about horses in video games and video games about horses. Apart from this being a subject that interests me and that I greatly enjoy talking and writing about, the site serves as market research for the horse game that I'm working on. During 2017 and 2018, I made it a bit of a habit to talk about horses in games on twitter, calling out inaccuracies where I saw them and praising detail work where I noticed it. More and more often, I got two particular types of feedback and reactions; On the one hand, fellow game developers and gamers who knew little about horses told me they liked learning about the subject from me. More importantly however, I started getting one type of comment/message from other equestrian gamers: "I thought I was the only one who cared about this!". I realized the overlap of passionate horse riders and interested gamers was bigger than I thought it would be, and I wanted a way to talk to those people, to convince those people they were not alone in caring about how exactly horses in games looked, moved and worked. The Mane Quest is intended to examine how horses are implemented in big action adventure games, to analyse trends and what is usually left out and why, to interview developers who worked on horses and hear their thoughts on which decisions were made for which reasons. Furthermore, The Mane Quest wants to dive deep into actual "horse games", a genre so casual and superficially "girly" that it is not looked at or taken seriously by the game press. I want to find out if good horse games exist and where one can find them. Since my full time job at AirConsole takes up most of my time, I work on The Mane Quest on evenings and weekends. The website itself was created with Squarespace and went online with 10 articles on October 23rd 2018. By Christmas 2018, the site had already been visited by over 10'000 people.